If you are building new, you have the opportunity to create your home around these two laws. A great heating design will allow you to use the natural movement of warmth to upper levels, and provide all the benefits of passive solar gain. For existing homes – in particular, those that are 25 years and older – fitting insulation wherever possible and elimination of drafts can reduce space heating by 50%. 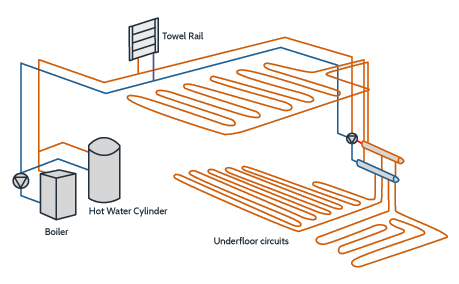 Around one third of a household’s energy is used in hot water – therefore, it makes sense to utilise the same low cost source used for space heating to give boundless hot water. Durability – Sealed hydronic systems are corrosion free, one can expect the components to be more durable than other plumbing fittings within the home.